Monthly Rental Example: $281.76/mo ($451.22 including taxes and fees) INSTRUCTIONS: Go to the bottom of this post under “HERE’S HOW TO GET CHEAP RATES.” If you don’t find a better rate there, then return to http://www.hawaiicarrentals.net/ and reserve a car there because those rate may be the cheapest you’re going to get or find for your particular travel dates. NOTE: I’m an authorized vendor of car rentals for Enterprise and other major national brand car rental companies in Hawaii, Canada, the USA mainland, and in fact, the entire planet where the car rental companies are located. Neither of my websites require you to pay in advance or even give your credit card number. You are not obligated and you can cancel at any time (or not even show up to pick up the car – but we’d rather you did or at least cancel your reservation). Go to our sister website, Discount Car Rentals Online. In the drop-down menu, click on Check Rates, then click Enterprise Rates. This will take you to an actual Enterprise reservations page (clicking on that link will pre-populate the form with a special hidden code that only Enterprise sees (it’s in the weblink) and also with visible text, “DISCOUNT CAR RENTALS INT’L,” which you’ll see over on the right) – fill in the form and check some sample rates. Hopefully you’ll find some really really great deals for the travel dates you’ve specified. NOTE: Please be aware that when using my Discount Car Rentals Online website, the bonuses and waivers that are offered on www.HawaiiCarRentals.net, such as additional drivers fee waivers and underage fee reduction DO NOT apply. If you don’t find a better rate at http://www.discountcarrentalsonline.com/ for your particular travel dates, then return to www.HawaiiCarRentals.net and reserve a car there because those rate may be cheapest you’re going to get or find for your particular travel dates. NOTE: If you don’t find a rate you like at the above website, be sure to return to http://www.hawaiicarrentals.net/ and reserve there instead. The rates there are awesome! This entry was posted on Saturday, April 24th, 2010 at 8:47 am	and is filed under Hawaii Car Rental. You can follow any responses to this entry through the RSS 2.0 feed. You can leave a response, or trackback from your own site. Can't do anything with this website! There's no link to click on in order to reach those quoted rates, no phone number to call, and no way to contact anyone to verify these rates, and no way to make reservations. The links that do click keep sending you in circles to websites that have much higher rates than those quoted here. Elliott, Elliott, Elliott… I state clearly in the second paragraph, "You may or may not find a great rate with the method I've provided, but if you have an extra couple minutes, it's sure worth a try to possibly save a whole lot of money isn't it? See INSTRUCTIONS BELOW." In other words, you have to read the whole blog and follow the instructions to see how to possibly find even lower than my already reduced rates that I have posted on my rates page. This is confirmed since many greatly reduced rate reservations are coming in EVERY SINGLE WEEK using the method I've outlined in this blog. I'm not saying you will definitely find greatly reduced rates for your particular travel dates and times, all I'm saying is if you spend a little time using the method I've outlined, you may. What may pop up for your travel dates might be even higher rates. That's why I say to go back to my rates page if you can't find a greatly reduced rate. I'm just showing a little trick I discovered and it may or may not work for your travel dates and times. On my blog I used to state possible rates as low as $108/week. But people were using the method I outlined and bookings were actually coming in for a lot less. So I started snooping around and found even cheaper rates and posted those. If someone finds rates for less than $68/week, $282/month, $14/day, the lowest rates I've found so far, I'll post that as the lowest rate found so far instead. Correct, there is nowhere to click to go right to that exact rate. Correct, there is no phone number to call because my website is self-serve and I just don't have the budget to staff people to answer the phones. I used to speak to people on the phone, but I stopped it after too many 1-hour calls where people were calling about 1-day rentals wanting to know this or that or trying to figure out how to save another dollar or two. On a 1-day rental, I might make $3.00 commission. At that rate I'd go out of business, so I try to answer all questions via my contact form (email) or put everything possible on my website. Got a question? Please use my contact form at http://www.hawaiicarrentals.net/contact.html. Sorry Steve, I have tried all those things you mentioned. Those quoted rates do not exist. I have been rerouted to all of those sites including yours so many times that I can remember every detail about them. The enterprise rates are outrageously high, much higher than some of the ones we have found already. The hawaiicarrentals.net rates are not any better. I guess your method didn't work for us! Nevertheless, we appreciate your courtesy and helpfulness. Thank you. Hi Elliott, I'm sorry you couldn't find a rate you liked. But like I said, my blog basically states that you may or may not find a great rate with the method I've provided. But if you have the time, it's worth a try to see if you can possibly get a great rate and save some money. Yes, it's true, just like all the car rental companies, some Enterprise rack rates at certain times and locations are literally triple (3x) what you can actually get by reserving Enterprise through my website link at http://www.HawaiiCarRentals.net. 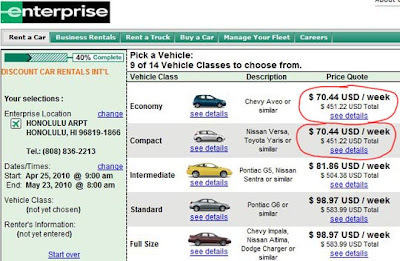 At other times, I've seen Enterprise rack rates as low as $68/week, $282/month, $14/day. That's why I put it on my blog. I see reservations come through my system all month long where people are getting rentals at 20%, 30%, 40% and even as much as up to 50% less than I'm even allowed to offer through my website. Since Enterprise rack rates fluctuate every day, there is no link on my blog or anywhere else to specifically get that rate. The car rental companies just won't make that deal with me. So yes, a specific link to "$68/week, $282/month, $14/day" does not exist and never will. I've never stated that. I simply state a method where you can navigate the system where if your travel dates and location coincide with a really low rate, you'll get that rate. I don't know how else to put it more simply on my blog to satisfy everyone. I have not been able to obtain the discounted underage surcharge you indicated ($10 vs. $27)!! It is not coming up at all in the dealer #4 you indicated. Hi Randy, I guarantee you will still get the discounted charge if you reserved Thrifty via my website. What they're showing you are the national terms and conditions. Thrifty Hawaii has special rates and waivers. See the full details on this page: https://www.hawaiicarrentals.net/car_notes_thrifty.html.